As soon as a university student graduates, he is faced with the challenge of finding his first job. Most fresh graduates apply for entry-level job positions to start their career. In this regard, an entry-level resume must be procured and submitted to the recruiters to initiate the job application process. Since you are a fresh graduate, making effective resumes for first job applications may be difficult to procure given the existing competition for the position. You can choose between different resume formats as presented on the templates of this website: the chronological, functional, or targeted resume format which is used for different types of applications. Applicant’s Contact Details – This information pertains to the personal contact information of the applicant that informs the employer on how to reach you. Resume Objective – This explains the smart goals you have for your career. The employer sees this as a list of your goals and expectations should you be hired by the company. Educational Background – Your educational attainment is included on an entry-level resume defining the range of your knowledge on the field. Since you are a fresh graduate, your highest attainment would be your college degree. List of Work Experience – This section provides a list of related work experience. For a fresh graduate, you do not have that much experience, yet but you have definitely undergone internship programs. Use this as your work experience. Additional Abilities – This includes technical, language, and other forms of proficiency and skills relevant to the job application. Certifications are also included in this section. Character References – The people you list as references would attest the authenticity of your resume and the information written on it. Provide genuine and professional information. Honesty can go a long way for you when applying for a job. Maintain professionalism all throughout the resume. Keep your resume short but concise. Limit your resume to one or two pages. Provide the most important information on your resume in a simple and straightforward manner. Highlight your strengths and achievements. Most modern resume templates are created with more information of the accomplishments rather than just listing down the job descriptions for each work experience. Give time to correct resume errors. Proofread your resume by correcting grammatical and typographical mistakes similar to the generic resume templates of this website before submission to the hiring employer. 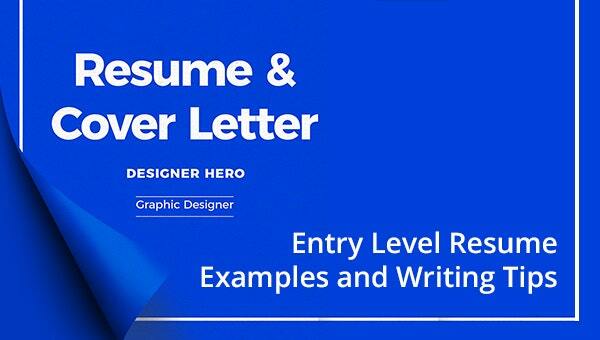 Creating an effective entry level resume for your job application may give you a competitive advantage even if you are still a fresh graduate. By following these entry-level resume examples and writing tips, you can rest assured that the resume you create will impress the hiring agents and may even land you that job.